At the meeting of the IMF and the World Bank, we began to see for the first time some blow-back against Obama’s hand-picket lawyer masquerading as the world leading of international finance. There were significant rifts between supporters and opponents of new state investment programs that LaGarde and Obama are trying to pull off taking pensions and squandering them on infrastructure that only produces temporary jobs anyway. 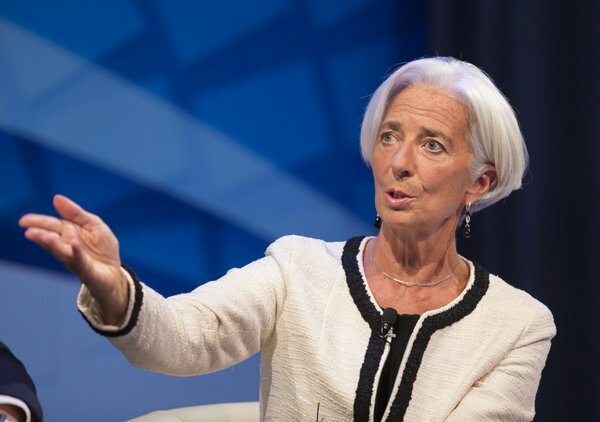 The LaGarde at the IMF warned at of the risks in the financial systems that amount to the shadow banks with a market of $71 trillion dollars. She asserted that this is a tremendous danger on the basis it is not regulated by her. Effectively, she wants to seize control of such money to bailout governments without reform. Lawyers who prefer politics to rule the world are different from private lawyers. They are the same type of people Shakespeare wrote – the first thing we do is kill all the lawyers. They were the king’s lawyers (prosecutors) since private people were not allowed to hire lawyers. These type of people are high on their power and only see things as writing laws to force people to do what they demand. The cannot understand just how do you stimulate an economy by raising taxes. They want to tax you 80% and then want to charge you negative interest rates if you do not spend what you have left. They are totally insane. They cannot comprehend where is economic growth supposed to come from? The only economy that has been holding up the Euro is Germany. Yet they impose Obama-Sanctions that have devastated the European economy. The German economy is on its knees, primarily due to the decline in exports.There is a growing battle starting to rage between politicians and real economists, yet within the economic community there is a huge division with the majority being closet communists and agree with the power of the state. Nobody is articulating a strategy against the looming economic slowdown that can only be based upon reform and lowering taxes. The conflict between the two camps had repercussions rising to the surface. In order to promote sustainable growth, there is no consideration that even talks about restructuring the world economy. We face a serious economic collapse sparking a Sovereign Debt Crisis that can only be viewed against the backdrop of historically high debt levels. We are headed into an economic storm that can be measured on the Richter magnitude scale of earthquakes that might be really shocking. This is an unbelievable toxic combination of escalating taxation with aggressive enforcement and astonishing global record debt levels thanks to the banking crisis of 2007 for to bail out the banks, global debt shows a sustained rising trend that has reached nearly 175% increase since the crisis began with no hope of stopping before 2020. This lethal combination will be our undoing and these people cannot grasp that taking what savings people have left will accelerate our demise. It was extremely interesting that at the meeting in Washington President François Hollande of France and the Italian Prime Minister Matteo Renzi insisted to push the consolidation of public finances in favor of economic programs on the back burner In other words – hello! They are now arguing for what I warned has to be done from the start – a single currency required a single debt. But this is too little too late. They have already lost the confidence of world capital. German Finance Minister Schäuble protested against Obama-LaGarde’s proposal to spend on infrastructure. Schäuble does not want to grant additional funds beyond the already planned investments in infrastructure. Largarde warned that Germany must take care not to go beyond the EU deficit limits. She wants to seize private funds not public to pretend the deficits are under control. Again, window-dressing without substance. Clearly, any pretend stimulation of demand through higher government spending has already produced nothing. If you keep raising taxes and enforcement, then where is the private spending coming from if disposable income continues to decline? Those in government are lawyers and just assume they can write laws to defeat the free market. The bottom-line is they are clueless how to manage the economy. They just do not teach this stuff is law schools – sorry! All they could do was the IMF invited countries to engage in economic risk-taking to push economic growth. At the same time, the IMF insists on austerity to promote the control of financial excesses. The IMF is just clueless and has articulated nothing as a solution.